Staff Sgt. David W. Textor, 27, was killed July 15 while conducting combat operations in Mosul, Iraq while serving with Company A, 3rd Battalion, 1st Special Forces Group (Airborne). He deployed in support of Operation Iraq Freedom in May 2008 as a member of the Combined Joint Special Operations Task Force – Arabian Peninsula. This was his first deployment in support of the War on Terror. Textor, a native of Jamestown, N.Y., attended Randolph Central High School where he competed in football, wrestling and track. He volunteered for military service in May 2002 as an infantryman. Upon completion of his initial entry training at Fort Benning, Ga., he was assigned to 2nd Battalion, 1st Infantry Regiment at Fort Wainwright, Alaska. 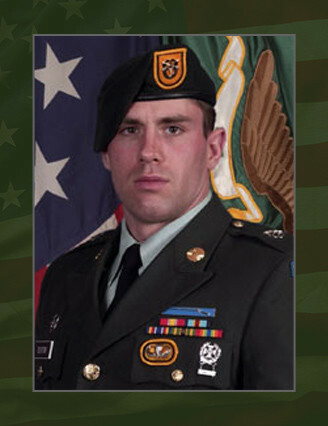 Textor began the Special Forces Qualification Course in May 2005, and he earned the coveted “Green Beret” in November 2006. He was then assigned to 3rd Bn., 1st SFG (A) at Fort Lewis, Wash., as a Special Forces Operational Detachment Alpha weapons sergeant. Textor’s military education includes the Warrior Leaders Course, Basic Noncommissioned Officer Course, Survival Evasion Resistance Escape Course, Basic Airborne Course, Ranger School and Special Forces Qualification Course. His awards and decorations include Bronze Star Medal, Purple Heart Medal, Meritorious Service Medal, National Defense Service Medal, the Iraq Campaign Medal with campaign star, Global War on Terrorism Service Medal, NCO Professional Development Ribbon with Numeral “2” device, Army Service Ribbon, Overseas Service Ribbon, Combat Infantryman Badge, Expert Infantryman Badge, Parachutist Badge, Ranger Tab and the Special Forces Tab. Textor was posthumously awarded the Bronze Star Medal, Purple Heart Medal and Meritorious Service Medal and Combat Infantryman Badge (all are reflected in the in the awards and decoration section above). Textor is survived by his wife, Colette, and their five children Caleb, McKenna, Ryan, Boden and Jadon of Olympia, Wash.; his father Bill Textor, of Pine City, Minn.; his mother and stepfather, Jennie and Kevin Lindberg of Roanoke, Va.; and his five sisters, Laurie, Michelle, Terra, Karen and Kellie.